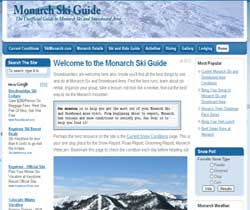 Mark Waird has started a new site called Monarch Ski Guide: The Unofficial Guide to Monarch Ski and Snowboard Area. He has some very interesting information, much of which is already found on the official Monarch website, but there is sort of an informal feel and other information such as a link to old area maps and a link to history. The site’s organization seems to be geared toward beginners thinking about coming to Monarch with lots of tips on how to make a visit the most successful and what to expect. I’ve asked him if he’d be willing to add instructor profiles. I’m really hoping he thinks about it. Seems like a pretty cool site that will probably do well in Google.